When Bennet received his G-tube at 5 weeks old, after having heart surgery, we were told he would just start eating eventually. He never did. We became incredibly discouraged with our son’s tube dependency. Bennet was miserable as well. He would see his older siblings eat and get so frustrated with his inability. None of us understood why he wouldn’t/couldn’t eat. 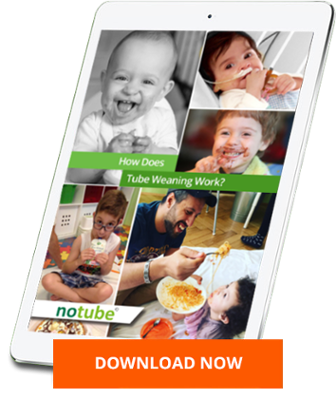 When we learned about NoTube we were shocked that there was a program out there that made tube weaning seem so possible! We were always under the impression that he would have to start to eat on his own before trying any kind of wean. Our lives were totally controlled with our son’s feeding schedule and anxiety over his non eating. In just a matter of a few conversations we knew we had made the right choice. To hear a group of professionals say that you have every right to want your child to eat was so refreshing. To hear that there was no reason that he shouldn’t be able to eat was amazing. And to be given concise easy to follow instructions was just what we needed. When the fear would set in, the NoTube team would squash them immediately. Essentially we were treated like normal human beings instead of a family dealing with a medical condition. It was very empowering to be able to make decisions like a normal mother would. The biggest and best change we have experienced since the wean is Bennet’s attitude. Within days he started acting more HAPPY. He had always been uncomfortable and overfed, but we didn’t know how to help him. Once he had the power over how he felt and what he was putting in his stomach his attitude changed immediately. He was proud of himself and we could tell we had given him the best gift we could have ever offered him. The entire family is functioning on a more normal level, with less anxiety and more enjoyment of one another.